Natasha, Michele, Jen and I stopped by The Chocolate Room in Brooklyn in the mood for something unusual to satiate our post-dinner sweet tooth. On a whim, we made a special request for vanilla milkshakes made with Sherry and they graciously indulged us, although we ended-up with Port shakes on account of an untimely Hidalgo Sherry outage. No matter, they were delicious and provided a perfect hybrid of dessert and digestivo - all in one divine, blended package. According to the manager, our Port shake experiment will now be appearing as a special on this weekend’s menu under the moniker “The King of Shakes” after my jokingly gratuitous suggestion that they name it after me was [rightly] dismissed. It’s actually a derivative of my nickname, but that’s neither here nor there. The beauty of this very proper dessert is in its simplicity and the meld flavours. 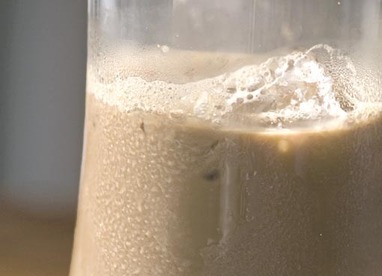 Key to this combination is excellent-quality Sherry or Port and homemade vanilla ice cream, or at minimum an ultra-premium vanilla from your favorite gourmet outlet. Plus the topping of a simple dollop of unsweetened whipped cream or panna, and a very civilized straw. Much as I would love to have a cupboard full of high-end, varietal-specific glasses, that just seems a bit too-too for a space-starved New Yorker. This has been a year of remodeling and carefully editing possessions – out with the lemon squeezer and in with a proper set of wine glasses. But which ones? After arduous research, I opted for the Scott-Zwiesel 'Fortissimo' Bordeaux wine glasses. 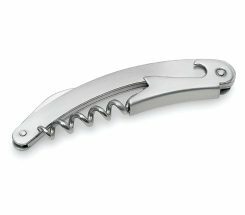 The Bordeaux shape is classic, and all-purpose enough to enhance any varietal from a big Barolo to a flowery Roero-Arneis. What’s genius is that they have fortified the glass with titanium to lend brawn and resilience, while still maintaining brilliance and clarity. 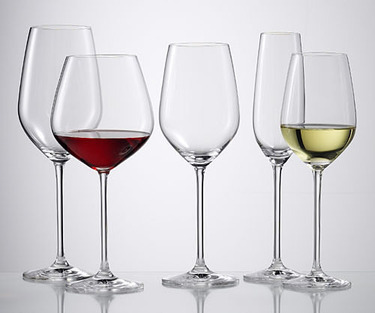 Measuring in at nearly 11 inches tall, their height and elegance make them the supermodel of the wine glass world. Plus, the 22-ounce capacity makes for good swirling. It just took me a bit before realizing that I was serving one-third bottle pours in each glass. Lucky dinner guests. That said - I still keep a separate set of glasses for bubbly as I’m a purist when it comes to sparkling wines. Ultimately, I’d like to replace the current set with the champagne flutes from the Fortissimo line, which would have been a perfect addition to my leisurely brunch at home with B. today that involved Ca’del Bosco Franciacorta. As one of Italy’s premier producers of bubbly, this bone-dry spumante (which is a generic term for sparkling wine in Italian) is made from a heavenly blend of Chardonnay, Pinot Noir and Pinot Blanc and is among my top picks for ringing in the new year – although I’m also contemplating Bruno Giacosa Spumante. Cin cin e buon anno a tutti! Over a recent dinner out with colleagues the topic invariably turned to which wine to order. Everyone has a different relationship with vino, and a quick poll demonstrated the relative disparity of what is considered a low-commitment versus a special-occasion wine. 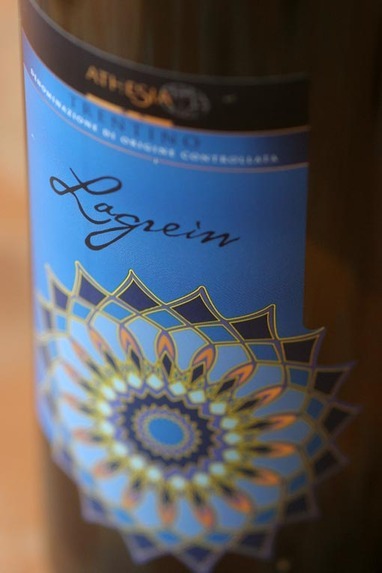 Preamble aside, that sums up an excellent Lagrein from a producer called Athesia in Trentino, Italy. At $10.99 a bottle it's a veritable bargain for everyday enjoyment, without depleting the coffers of Nova Clutch cellars - much as I wish it were full of only the likes of Quintarelli, Bea and Gravner. Artesia’s Lagrein made an appearance the other evening, when chilly weather called for grilled skirt steak, roasted heirloom carrots and purple cauliflower mash with Parmigiano-Reggiano. Pure comfort food to mitigate the culinary dilemma now that tomatoes are no longer in season - about which Natasha and I are still in denial. At least a few glasses of this lovely Lagrein helped ease the drama. I open this one up for commentary - what do you consider an everyday wine? I've been wrongfully dismissive of Sauvignon Blanc. Wrongful in that I’ve clearly been missing out. 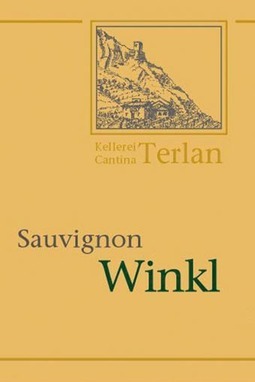 Given accusations of geocentricism in my wine preferences (I’m sure I have no idea what anyone is talking about), it should come as no surprise that this particular Kellerei Cantina Terlano Sauvignon hails from Trentino-Alto Adige, in a region known as Südtirol. This Terlano Sauvignon is viscous, rich and ripe, with the faintest floral nose. A touch of apple and peach, and an undercurrent of tropical pineapple – all of which shine through the greenish-yellow colour. On first blush, it has a hint of grapefruit and Meyer lemon – but with greater restraint than those from New Zealand, which can be tricky with food. Shimmering bright herbaciousness and slightly dirty – in a good way – minerality hints of the sandy, porphyry gravel in which these grapes were grown prior to being aged in stainless steel for eight months. And nary a touch of oak. All the makings of a great wine in my book. B. - a previously confirmed red-wine drinker - and I opened this up one night over light meal of salumi, formaggi and Lacinato kale salad when it was simply too hot to ignite the oven or turn on the stove. We uncorked this wonderful wine with my recently acquired waiter’s friend corkscrew, which has risen above the rest on my quest for the ultimate opener. It’s refined, elegant and handsome – much like its gifter. 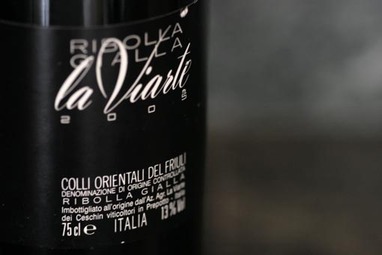 Ribolla Gialla, a native Friulano varietal, is a seriously solid white that holds its own against flavorful, rich foods - and enough to make a believer out of even the most stalwart red wine fanatics. This particular producer, La Viarta, is situated in a miniscule growing region known as Prepoto, also home to eccentric and innovative winemaker Edi Kante. I had the incredible pleasure of visiting this region (and Kante's fantastical winery) a few years ago - the amazing wildflower honey and bright olive oil from which still linger in my memory. By sight, this La Viarta has a wonderfully bright and characteristic straw- to greenish-yellow color. Pure Ribolla Gialla. By smell, our Ribolla turns up pears, apples and tropical fruit hints. What's so delightful is the utter balance of full-bodied flavors; rich on the palate with apples, yellow plums, tarragon and undertones of pineapple and passionfruit, accompanied by wooded undertones - despite being entirely unoaked. Grown in a sandy, Eocene marl - for you and me, that means a mixture of clay and lime - which imparts that deep, intensely luxurious mineral finish. This Ribolla Gialla is hand harvested, aged in stainless steel and spends one month in the bottle before releasing its wonderful goodness to the outside world. La Viarte also produces Refosco Dal Peduncolo Rosso, Schiopettino and Tazzelenge - mysterious varietals of the strange that I crave, but have nary a way to get my hands on this side of the Atlantic. That unto itself warrants a return visit to this obscure and wonderful corner of Italy. I've always harbored a secret fantasy of finding a rosé that is a perfect meld of white and red. Despite endless "rosé is the new black!" editorial, hopes have been dashed when blush wines reminiscent of wh*te zinf*ndel materialized. And that's nobody's idea of a good time. 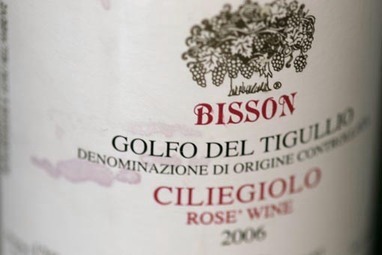 That said, "sheer delight" sums up Bisson's Ciliegiolo (chee-lee-AYE-geò-lo), made from a rare, unique grape cultivated in northwestern Italy's Ligurian coastline. While Ciliegiolo is rumoured to be a distant relative of Sangiovese, little is reminiscent of its lineage. This particular rosato is on the darker side of pink. Natasha and I enjoyed our crimson beauty with a summery ratatouille. Bisson recommends an optimal serving temperature of 61˚F (16˚C), but a brief spell in the refrigerator beforehand does the trick. On the palate, Ciliegiolo is ripe with intense fruit flavors of cherries and forest berries and a touch of tartness, complemented by an enduring, minerally finish. Aged entirely in stainless steel, this fermentation process imparts a fresh and lively acidity. In addition to tasting amazing, this wine is also a feat of acrobatics - which lends even more to its charm. Artisinal winemaker Pierluigi Lugano has done his part to lovingly preserve increasingly rare, indigenous varietals such as Ciliegiolo. Cultivation is truly a labor of love and done by hand, as it is one of the world's most absurdly impossible grape-growing regions. Gravity-defying gravely hills give way to steep slopes high above the Mediterranean below, where harvesting machinery is simply out of the question. Our friends Jen and Tom shouldn't have asked if we wanted anything from Italy when they went last week. Because of course, we asked for something they had to run around the whole of Florence to find. But I think it was worth it. I have been lusting over a bottle of this precious elixir for a long time, and have been told repeatedly that you cannot buy it in the States. So Tom ransacked Florence and found a tiny bottle of it. Santa Maria Novella is more famously known for its herbal colognes and cosmetics, all of which is packaged beautifully. This liqueur is a gorgeous pink color and is so pretty that I almost didn't want to open it. Almost. The taste actually stunned me. The nose is overtly rose with a tinge of sweetness – basically it smells like turkish delight. The alcohol sits somewhere between the rose and the sugar, none of the three elements overpowering one another. It's silky smooth, no alcholic bite and no cloying sweetness. Just amazing. I have to say, it blew mine away. After the stress of liqueur-hunting and traveling back to New York, Jen stopped by Lafco on her way home. 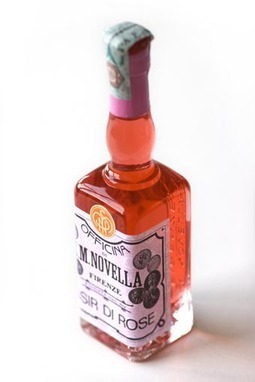 Apparently they sell Santa Maria Novella liqueur there now. It's official: I love this wine. A special gift from Lombardia, in the form of a 750 mL bottle. Italy is home to some 2.000-odd grape varietals, and this 2003 Diana F.lli Trevisani is one of the 'odd' ones - a blend of Merlot and Rebo. Rebo is shorthand for Rebo Rigotti - an experimental hybrid created 1948 by Dr. Rebo Rigotti that involved crossing Marzemino with Teroldego grapes. His namesake results are stunning, and have now earned DOC designation. Leather and licorice on the nose, as well as mossy, forest floor characteristics. Dark, dark earthy taste with a hint of spice and some serious tannins. Those are the Teroldego underpinnings showing through. While it may leave you vaguely parched, it will certainly not leave you for wanting. Utterly bone-dry, but balanced, like a witty sense of humor. Merlot rounds out the edges for a lush and lengthy finish. If it's possible to pair wine and music, this one would have a Sigur Rós soundtrack. Both are otherworldly and ethereal and best enjoyed on a rainy night when late-spring is giving way to the sultry humidity of summer, and a fit of insomnia [or maybe that's just this scribe's state of mind]. Montepulciano D'Abruzzo is a stalwart companion for many a meal, but a Montepulciano from Puglia? There's a new twist. The Puglia region (the "heel" of Italy's proverbial boot) is famous for its Trulli homes, and was the subject of a recent, raptuous story in the New York Times travel section. And quite possibly my next travel destination. So when my trusty wine pal at Astor Wines was gushing over a bottle of Antica Enotria Montepulciano from this region, it was an immediate purchase. Plus, it was in the corner section, where I'm often caught looking moony over the Gravner Ribolla Gialla Amphora and various Quintarelli vintages. Swoon. 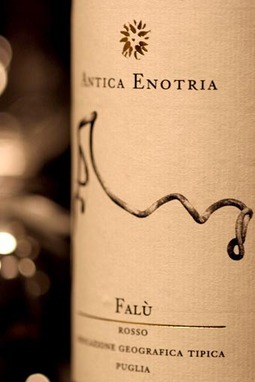 Antica Enotria's vines are cultivated using stringent biological cultivation practices. Garnet hued or, as every bottle of red in Italy seems to say, "the colour of red rubies." Leather, dirt and licorice on the nose. Fruity with bramble berries, and wonderfully unoaked, just as promised. Plus a very nice dry, lenghty finish. What's delightful is how versatile this wine is. So nicely balanced that it stands alone, although it would be perfect with a little finnochina salame from Di Palo's, the venerable house of mozzarella and all things deliriously good and Italian in New York's Little Italy. Recommended Pairings: Salumi, peppery greens, meat stews, grilled polenta with cheese. Yes, you read that correctly: Merlot. This particular wine is one my favorite party tricks. 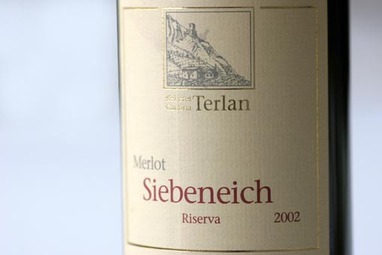 Cantina Terlan Siebeneich Merlot Riserva is a pedigreed gem that suggests little of the uninspired varietal that one usually associates with Merlot. Perhaps I'm perverse, but there's something utterly delightful in being proven wrong about the basic tenets one holds true when it comes to wine. This notable Merlot smells faintly of marjoram, and tastes of concentrated plums and red currants that meld together into something entirely pleasant. The vines are grown in clay and sandy soil 800 feet above sea level, producing a wine with a seemingly higher alcohol content than its 13% . The Kellerei Cantina Terlano cooperative has been lauded for exemplary permutations of classic and lesser-know varietals, and has received several Tre Bicchieri awards from the Gambero Rosso guide. 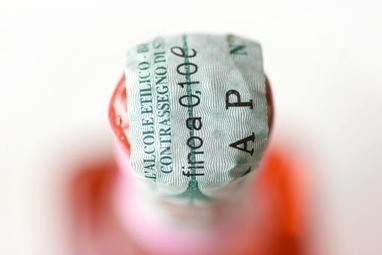 One of the things that always throws me right off is the non-Italianate names of the vintners and wines from the Trentino Alto-Adige region, owing to the neighboring countries of Austria and Switzerland - the Italian we all know ends in a lilting vowel and most certainly doesn't contain umlauts. 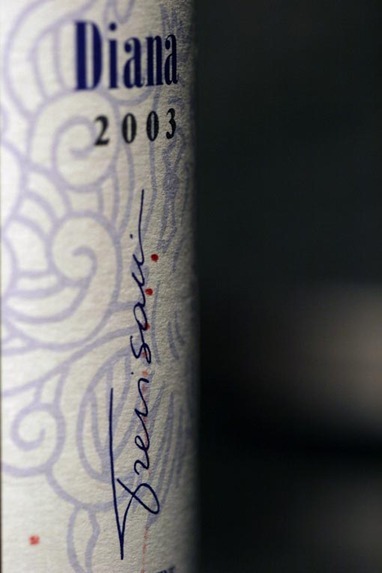 That Terlan's Merlot also happens to be a ridiculous bargain at Astor Wines is simply a bonus. With such a high value-to-tastiness ratio, a bulk purchase doesn't require a second invitation. The Nova Clutch cellars have bottle of Terlano's Porphyr Lagrein awaiting one inevitable last cold spell, and their Sauvignon Winkl is on the wishlist for a summer roof-deck meal of softshell crabs and grilled asparagus. Recommended Pairings: Pork dishes, sausage of any sort, pasta Bolognese, Pecorino Romano.